An artist surprisingly prolific surprise, Indra is the Klaus Schulze of Romania. From 1993 till 2010, he throws 40 albums for the pleasure of our ears. And in the lot there is several which are very solid. I discovered this fascinating artist in 2005 with his very good Echo in Time that I had reviewed about 6 months later. Since then, it was love at first sight to my ears! His music, highly inspired by the Klaus Schulze model, is consisted of very long minimalist structures of which the charms lie in the subtle evolutions which were noticeable long after their appearances, so much the bewitchment was there. From purely Berlin School, the music of the creative Rumanian synthesist took a clearly more Hindu spiritual tangent as Indra affixed its claw in the universe of EM. His series Tantric Celebration, as well as the superb set of The Call of Shiva, diverted the music of Indra towards the bewitchment of the Hindu spirituality. Except that the artist was also capable to put things in perspective by getting back to roots and by offering very good albums of a more Berliner EM, such as The Challenge, The Pyramid Concert and more recently Thunderbolt-Live at the Black Sea. Indra had become a little more silent, less creative I would say, since 2010. The synth wizard from Romania reedited little by little his catalog by dusting out old albums of the 93-94 era. I remember having spoken with him at that time and he said that he had an enormous range of music hidden and lost in his uncountable sessions of composition or recordings. He also had complete albums on cassettes with a quality of recording very lower than the digital quality. His fans, of whom I, asked him if one day we would have the privilege to hear everything of the Indra universe. This day has arrived with the Archives series. Listed in 25 albums which are divided into 5 categories, Archives is the equivalent, no more and no less, of this titanic sonic adventure of Klaus Schulze with his Ultimate Edition. This huge Boxset of a priceless value for the fans of Indra follows a chronological order and covers the periods 1993 in 2015 with a new album which will go out each week starting the spring of 2015. The series Ruby drags us in the oldest universe of Indra by covering the 94-98 years, with some more contemporary tracks that we will find in Ruby Four and Ruby Five. The albums aimed by “Ruby One” are Self Game and Magic Collection, released in 1994, as well as The Way Out and Tales from Arabia, which went out a year after. We did have a foretaste of this sonic feast with Interactive Play (TheEssential) Vol. I and Vol. II back in 2011 when Indra had succeeded in remixing old tracks by giving them a tone which answered the standards of the industry. And it's important to make this clarification because Ruby One and Ruby Two (the only ones that I heard to date) sound like these old compilation recordings that we made on cassette in the 70's. And Indra had warned his public of this possibility. But the demand being strong, the friendly Rumanian synthesist eventually gave up and offers us finally this music that his fans looked forward for a long time now. It's in the very old vaults of Indra that "Self Game" carries us. The introduction is pompous to the top with a storm of staccato movements which tear the silence with brightness. Yes the sound is old and the hisses fill the background, but the Indra signature is very present with lively orchestrations where hides a movement of jerky sequences which stretches its spasmodic flow. The tone of sequences is hybrid, as is it often in the universe of Indra and the keen knocks jump up with the complicity of percussions, other element which adds to the depth of the rhythms of Indra, while the synths weave layers of voices which float within the violence of the orchestrations. And as often, the rhythm is as lively, I would say violent here, than melodious. That sounds old. Very old! We hear the hisses from old tapes almost everywhere and that reminds me those cassettes of Baffo Banfi and Earthstar, but the essence of Indra is already recognizable between one thousand. "Ascending" comes doubtless from the same era with arrangements which are more fluid. Orchestrations of an Arabian film kind which encompass the swiftness of sequences, that we hardly guess here, but not the percussions which bludgeon a rhythm clearly slower than the orchestral impetus. The delicacy of Indra, his romantic side, has often nuanced his approaches. At least the violent ones or still his minimalist ethereal moods. Some pearls of tenderness are nest here. Like the very beautiful lunar lullaby which is "Land of Peace" where the stars sparkle among the whimpers of the cosmos. "Angel Day" is another beautiful bed song for souls at adrift with sequences which sing as much that they cry. It's touching and the cloud of hiss eventually disappeared in the tenderness of the track which assumes its perfumes of Vangelis. "Dawn" is going to raise the hair of our spine with a superb cosmic flute which doubtless has everything to charm the goblins of the Middle Ages or to say the least fed their whims. The same goes for "Eleodor" which is a little more ambient on the other hand than melodious. It looks like a water, oozing of the walls, which cries with these layers of seraphic voices. "Center" is more a track of atmospheres with electronic effects which feed the spiritual chants of the flutes, whereas the introduction blown of atmospheres from "Dance of the Fairies" leads towards a fascinating movement of peasant dance of the Middle Ages era; a perfume which rests delicately on several of the tracks in “Ruby One”. The movement becomes jumping, even throbbing with muffled but heavy pulsations which pound with too much strength within some beautiful synth lines carrier of elixir for sleep. The sound is immensely rich, too even for the possibilities of recording of that time. It's definitively a piece of music that I wish Indra will redo entirely someday. "Weeping Spirits" is an ambient title fed by long drones, by long woosh and by synth layers boosted by ochred colors where thunders a meshing of percussions and jerky pulsations. "Mecca" is another ambient track with some spiritual flavor this time with effects of guitars which scratch a Hindu tribal rhythm supported by manual percussions and tears of violins. The sound is difficult to discern here, but we discover the nest of the Indra universe. "Ever Point" is another ambient piece of music with heavy layers built upon organ tones which create an environment of Fantome de l'Opera. Percussions shake a little the atmospheres, bringing the kind of cathedral approach towards these structures of ambient minimalist rhythms that Indra will lay down some years later. After an ambient intro, where notes of gypsy guitars roam in banks of sinister mist, "Late in the Night" turns for a rhythm delicately hopping. The pulsations buzz and the jingles dance, while Indra lays this minimalist structure where percussions change a little bit a stillness velocity which still fed by perfumes of Arabia. "The Calling" is a little bit in the same style while "The Way In" is more in the very Schulzian ambient genre with layers of organ, of voices and with percussions which thunder and roll in a finale which refuses to abandon its coat of atmospheres. 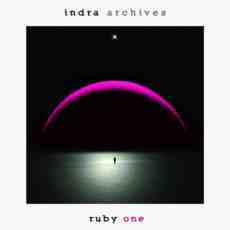 Essentially for the fans of Indra, “Ruby One” is a compilation of pretty nice tracks which are retrieved in recordings of which the sound suffers of the wear, and of time and of the technological breakthrough regarding recordings. The music there is charming, sometimes even very beautiful. Only the limitation of the sources of recording of that time prevents our ears from savoring it without having shivers of annoyance in eardrums. But no matter, the machine is underway and I wait for this Archives series with the biggest impatience because Indra is synonym of very beautiful ambient, meditative or sequenced music to make roll our thoughts, to make rock our souls. The proof is here and I attack Ruby Two without other delay!